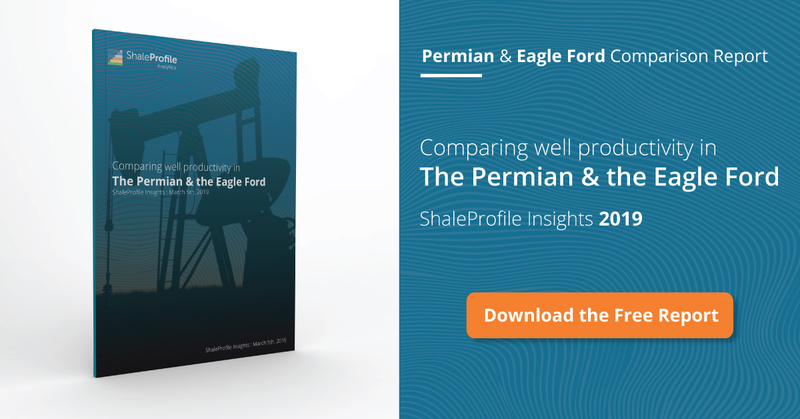 This interactive presentation contains the latest oil & gas production data from 19641 horizontal wells in the Eagle Ford region (TRRC districts 1-4), that started producing since 2010, through September 2017. After extreme weather events in August, production in September has mostly recovered in the Eagle Ford to pre-Harvey levels. This is not yet visible in the above graph as production data for September was not yet published for a number of operators and leases, most notably for ConocoPhillips (which operates ~100 kbo/d production from horizontal wells). In the “Well quality” overview we can see that since 2014 the average well performance has not changed much. A bit more oil is recovered in the initial phase, as well as more natural gas, but the decline curves are very similar. This is unlike the other basins, where we’ve seen larger improvements in the past 2 years. In this “Ultimate Recovery” overview the relationship between production rates, and cumulative production is revealed. For example, by following the orange curve, you can see that the wells that started in 2014 have on average recovered ~132 kbo after 3 years on production, and are now at rate of 45 bo/d. By switching ‘Product’ to gas, you’ll find that in addition these wells have produced ~0.5 Bcf of natural gas. The 4th tab (“Productivity ranking”) ranks operators by the average performance of their wells. Of the major operators (> 100 wells), Devon & ConocoPhillips show the best results, as measured by the average cumulative oil production in the first 2 years. If you hover your mouse over (or tab on) the results for Devon, you can see that it has 754 horizontal wells that already have produced for at least 2 years, and that on average they recovered 213 thousand barrels of oil in the first 24 months. Around the middle of next week I plan a new post on all 10 covered states in the US. Your data is absolutely fantastic – now the higher GOR ratio’s will hopefully come through into the EIA monthlies (September was a little surprising, but there seems to be minority view that they will be revised down). My focus is on reporting the data in an easy to understand way, and I hope that others (like Jilles van den Beukel, Scott Lapierre, and the many expert commenters here) use it to tell us what it all means. so far, Enno’s data is not that consistent with “Bubble point death” curve by Scott Lapierre yet.